As I sit down to write my last journal article review for The George Center, I am filled with gratitude as I reflect on the growth I have experienced during my time here! The professionalism and clinical skills I have been been able to train under truly have prepared me for whatever the next steps will be in my music therapy career. I am beyond thankful to The George Center for the variety of populations and settings I have been able to work with over these past six months. That said, one of the final additions to my internship caseload has been assisting with a Parkinson’s Choir, which is facilitated by two Board-Certified Music Therapists from The George Center. The primary goal of this choir has been to increase support systems amongst the individuals with Parkinson’s disease community and decrease diagnosis-related symptoms through therapeutic techniques. Parkinson’s disease (PD) is defined as a progressive neurodegenerative disorder that leads to altered neural control of movement, including the control of voice, respiration, and swallowing (Stegemöller et al., 2017). Research shows that there is up to 90% prevalence of voice and swallowing difficulties in persons with PD, and neither medication nor deep brain stimulation surgery has proven to effectively treat such symptoms. Therefore, the need to provide therapy for voice, respiration, and swallowing difficulties remains a constant need amongst this population. Music therapy gives individuals the opportunity to strengthen and maintain current function within these areas of impairment through interactive, music-supported interventions. This particular article fascinated me, as it highlighted the personal experiences and benefits of 20 individuals who participated in singing interventions for 8 weeks. The individuals ranged from ages 47 to 82. There were 14 male and 6 female participants (Stegemöller et al., 2017). After 8 weeks of weekly sessions, each participant was given the opportunity to share how the group impacted him or her physically, emotionally, and socially during a private interview. The overall results were positive, as individuals reported improvements in their volume of speech, communication, as well as a growth in their PD support system. For this study, specific therapeutic exercises were used during each session. Some of these included lip buzzing, glissandos, a vocal intensity (i.e., loudness) exercise, articulation exercises, and group singing (Stegemöller et al., 2017). Lip buzzing is explained as a useful intervention with this population because it requires a minimum amount of air pressure to maintain lib vibration. 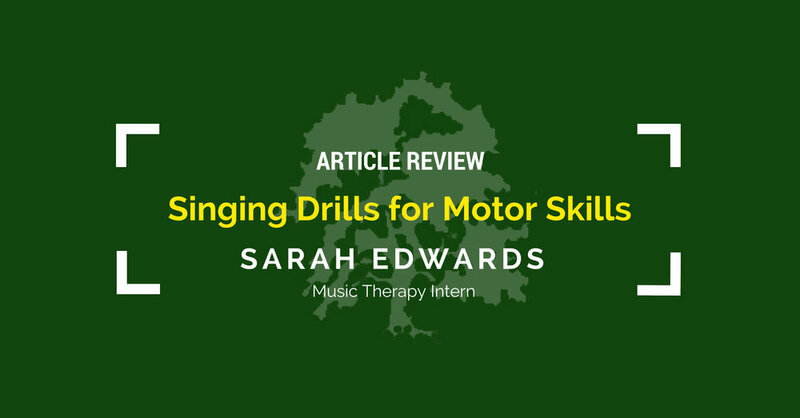 Over time and with practice, this can be strengthened for each individual, resulting in the ability to add pitch and more overall vocal control to the activity. Glissandos can be explained as sliding between pitches vocally. For this technique, the music therapist started out with a small range of 3 notes apart, and over time was able to increase the pitch range to 8, which is a full octave on the piano. Vocal intensity exercises during this study used a decibel meter to systematically increase loudness each week. The duration of the vocal intensity was produced in 2 second intervals. The last technique applied weekly was an articulation exercise, which are designed to focus on the articulation muscles of the lips, tongue, and jaw. Starting with singing the consonants, “mee, meh, my, moh, moo” the music therapist was gradually able to get participants to replace “m” with the consonants “t,” “d,” “s,” and “k”. Engaging pitch control and air pressure together can be challenging for this population due to the progression of the disease that can impact the muscles that control vocal usage. Therefore, warm-up exercises are important to implement with regular practice. In addition to these exercises, subjects were given CDs of breathing and vocal exercise to do at home twice a week. During the Parkinson’s Choir I currently assist with, one method I have seen used in exercises is the addition of movement. Participants are sometimes instructed to move their arms up and down with the pitch, or progression of the musical phrase. Another exercise that has been implemented that focuses on vocal pitch, sustaining breath, and volume is a vocal siren. Vocal sirens are essentially producing pitches while letting breath out in a yawn-like fashion. The sound is first produced softly, then gradually to the loudest sustainable volume, and back to a soft volume, like a siren. Throughout this exercise patients are encouraged not to breathe between volume changes, in order to strengthen the vocal muscles that are engaged during the exercise as well as increase breath control. From this article, I took away the importance of consistency, which over time built vocal and respiratory endurance in participants. Participants regularly attended the group and completed the CD exercises twice a week. Many of the individuals referred to singing as a ”work out” and I would agree with that statement. Posture, breath support, and core muscles all have to be used to produce loud and sustained vocalizations. Singing is unique to the body in that it is able to work such minute, but essential mechanisms. Strengthening the oral motor functions through singing is especially effective for Parkinson’s patients because it can prevent future regressions in functions like swallowing. Being able to complete singing and respiratory tasks gives individuals a chance to “work out” their body, while also building confidence in their ability to develop skills in spite of their degenerative condition. In addition to physical benefits, group music therapy in this form can also be extremely social. Emotional support is particularly important for people coping with any type of disease. The nature of degenerative diseases like Parkinson’s tends to increase the likelihood of individuals becoming less social, decreasing their support systems, becoming dependent on a small number of caregivers, and potentially even feeling embarrassed of their physical symptoms in typical social settings (Stegemöller et al., 2017). All of these possibilities heighten anxiety, increase depression, and decrease overall quality of life as individuals have the propensity to feel hopeless as the disease progresses. Music therapy provides an opportunity for empowerment and support of individuals living with all stages of such conditions. As emotional and physical domains are mutually impacted, the therapeutic value of music for this population is unique compared to all other options. I was thrilled to find this study and look forward to seeing the Parkinson’s Choir continue to grow during my remaining time at The George Center. As a new professional, I will continue to study research and integrate the best practices in the treatment of my clients. I will continue to implement interventions as the ones mentioned previously, as they have shown positive effects in the short amount of time I have been involved with the choir. This article was a wonderful reminder of the many benefits group treatment can have for individuals living with a degenerative diagnosis. It is a great reference for professionals starting a music therapy program or ensemble with this population. I look forward to more research developing to support these practices with Parkinson’s disease. As more research is done, music therapy as a nonpharmacological treatment option will hopefully increase for this population as well.